You expect the best ride experience from your ATV or motorcycle, you want the best in ergonomic contouring for awesome motorcycle and ATV adventures whether it is at the beach, on the highway or on rugged off-road terrains. 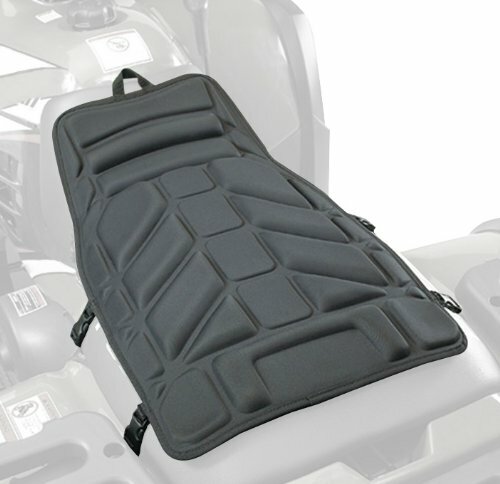 The Coleman comfort ride ATV protector promises to protect ATV and motorcycle riders in maximum against changing engine temperature with maximum cushioning plus comfort. Here’s a lowdown on what you need to know about the Coleman comfort ride ATV protector. The Coleman comfort ride is a good addition to any quality motorcycling experience and is a cost-effective alternative to more expensive Airhawk cushions. With the Coleman, three quick release buckles effectively hold the protector in place making for a more comfortable ride and is so adjustable that it can even fit a Suzuki DR-650. The unit’s water resistant design make for great long distance travel while avoiding unpleasant long distance moisture problems that cycling enthusiasts often experience. The Coleman comfort ride is easy to set up and maintain by carefully removing the side air dams, removing the seat while taking care not to upset the fuel line, detach the cords and then extending them to maximum length for placement under the seat. Then reposition the seat, bolting it down replacing the air dams and clip the cushion on making it one of the easiest cushions to place on a cycle. The price is outstanding compared to its more expensive peers coming in at under $25 for the finest product seat enhancement at an affordable price. The unit fit a broad range of cycling brands from the Yamaha Bruin, Yamaha XT250, and Kawasaki Concours ZG1400 to the Honda Ruckus and many more.